Astrology is one of the most beautiful tools available to we humans to understand our strengths, weaknesses and to take remedial measures so as to get over the weaknesses and to strengthen the strengths so that, in the process we evolve to be better humans. Astrology is all about the specific earth centric planetary positions, at the time of our birth and their influence on us. For eg; to a person with a weak confidence factor, astrology advises him to work out in Sun during the early morning hours of sunrise (planetary body afflicted is Sun, in this case). To a person prone to skin infections, to include green gram in daily diet as well as to wear green dresses and be in Sun, again during morning hours (affliction to mercury). To a person with very less assertive skill and who has too much negative aggression, it is advised to practice martial arts or to play some vigorous games so that the negative energy is vented out (afflicted planet is mars). To a person with substance addiction is advised to drink lots of buttermilk (fat removed and churned curd) with asafoetida (planet afflicted generally being venus). Unfortunately, the science fell into the hands of unethical practitioners who used this as a means for power and money and the subject attained an overly mystical status. The other problem was that the science is so complex that, it needed many years to master it that very few qualified to be good. Let us use this opportunity to neutrally review this science. 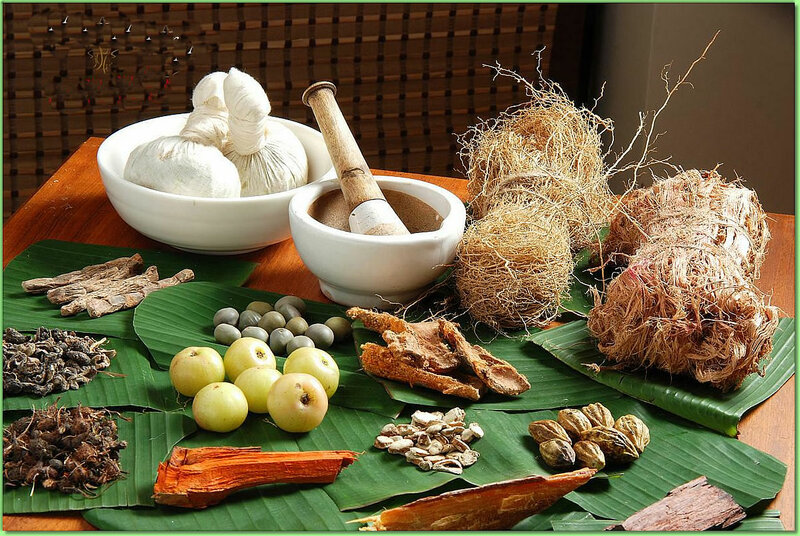 Vedic astrology is said to have been developed by the ancient seers of India, purely on observation and insight. Most of their insights, including the calculation of distance between earth and the moon/ mercury/jupiter/saturn, without the help of any complex equipment are now proving to be right. These seers, known as Rishi’s, observed that certain apparent planetary combinations and relative positions lead to the development of certain circumstances and behavioural patterns. They formulated them as rules and developed 18 schools of thought like Garga’s, Bhrigu’s etc. Some of these rules are contradicting and hence this science is classified as one which needs lots of discussion and intuition. As per this science, each person has a favourable time and unfavourable time for every important aspect of his life like getting a job or marriage or illnesses etc. By trying to understand these, the science will prepare the person so well that he benefits from the struggle too. Kalaripayattu is the oldest existing martial arts form, dating back more than 2000 years, and is said to be the forerunner of popularly known Chinese martial arts, as the Buddhist monk Bodhidharma took this knowledge from India to China. 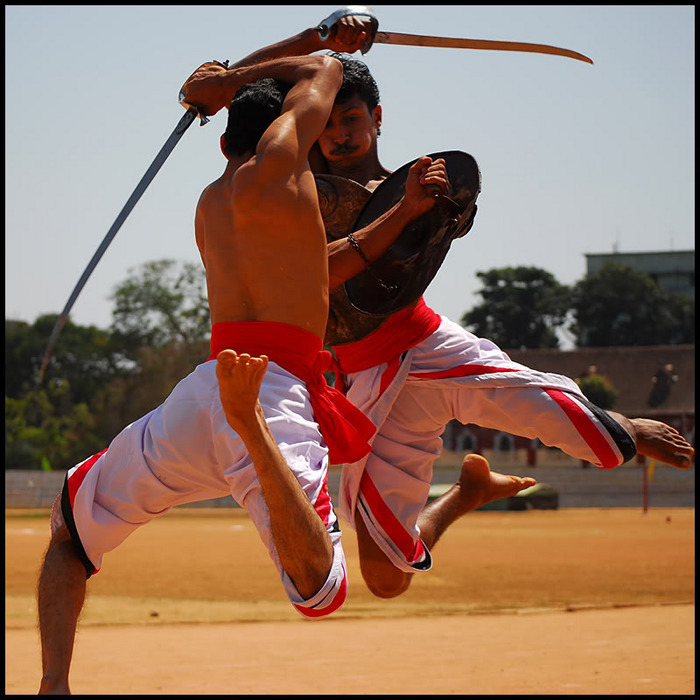 This martial arts form is indigenous to the Southern Indian state of Kerala which, legend has it, was created by the warrior saint Parasurama, an incarnation of Lord Vishnu, by throwing his axe into the sea which receded till the point where it fell. Parasurama then established forty-two kalaris and taught twenty-one masters of these kalaris to protect the land he created. 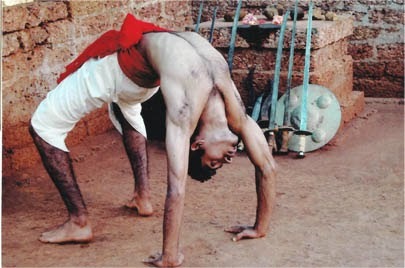 Kalaripayattu is a traditional psycho-physiological discipline emanating from Kerala’s unique mytho-historical heritage as well as a scientific system of physical culture training. The historical antecedents of this martial arts form combines indigenous Dravidian systems of martial practice such as ‘varma ati’ or ‘marma adi’ with an influence of Aryan brahman culture which migrated southwards down the west coast of India into Kerala. There are two distinct traditions in Kalaripayattu-the Northern and the Southern schools.Drop us a mail at vz@smskrti.com to know more . 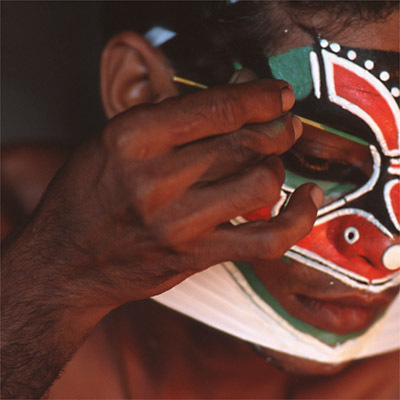 Kathakali is the most well-known dance drama from the south Indian state of Kerala. 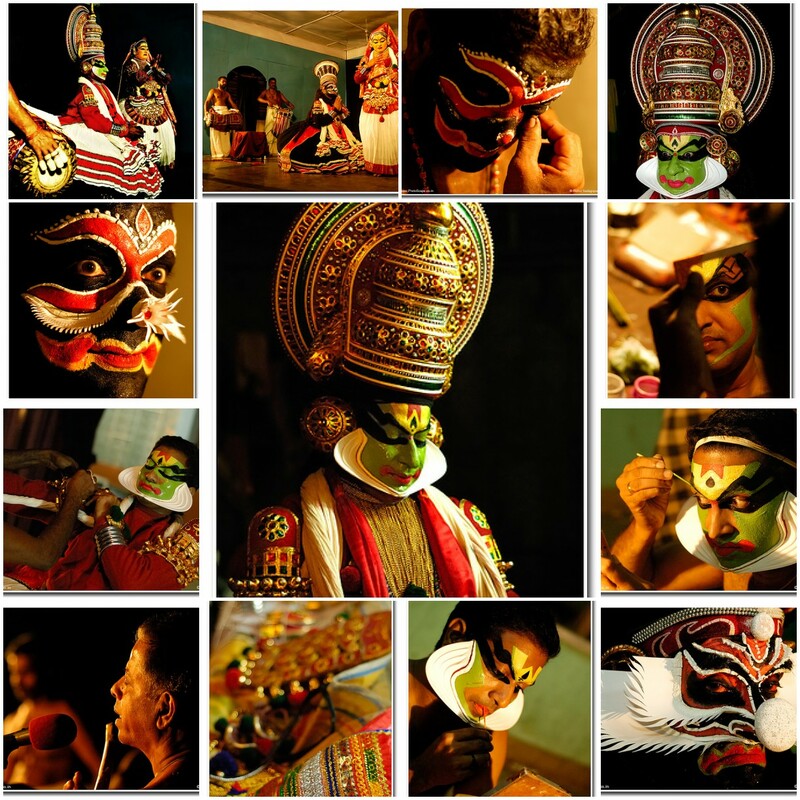 The word Kathakali literally means “Story-Play”. It is known for its large, elaborate make-up and costumes. The elaborate costumes of Kathakali have become the most recognised icon for Kerala.The themes of the Kathakali are religious in nature. They typically deal with the Mahabarat, the Ramayana and the ancient scriptures known as the Puranas. This is performed in a text which is generally Sanskritised Malayalam. A Kathakali performance is a major social event. They generally start at dusk and go throughout the night. 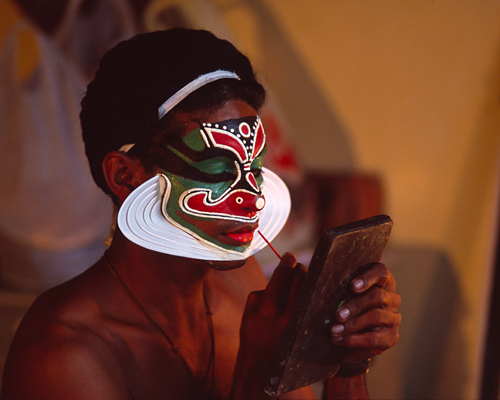 Kathakali is usually performed only by men. Female characters are portrayed by men dressed in women’s costume. However, in recent years, women have started to become Kathakali dancers.